Examine changes in extracellular matrix (ECM) gene and protein expression and histological structure to determine the anti-aging efficacy of cosmetic ingredients or final formulation. EpiDermFT is available from a range of adult donors. EpiDermFT tissues (Figure 1) are equilibrated overnight under standard culture conditions (37C, 5% CO2) with EpiDermFT Assay Media (EFT-400-ASY). 18-24 hours later tissue culture supernatants are aspirated and replaced with fresh, pre-warmed media. EpiDermFT is exposed to test formulations or active ingredients for 24-72 hours. 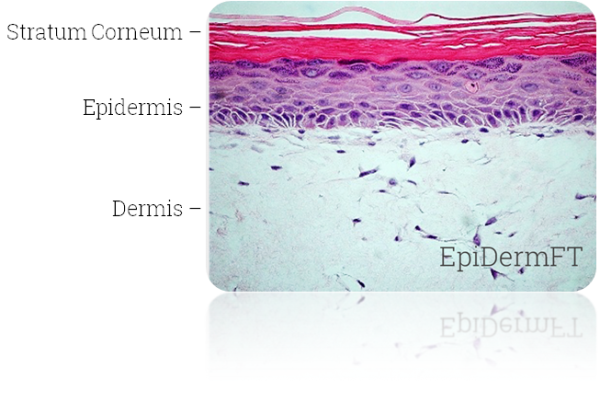 Following exposure, EpiDermFT is harvested for RNA isolation, protein isolation or histological/immunohistochemical evaluation. EpiDermFT tissues treated with Formulations A showed significant increases in Collagen 1A1, Collagen 3A1 and Elastin gene expression. 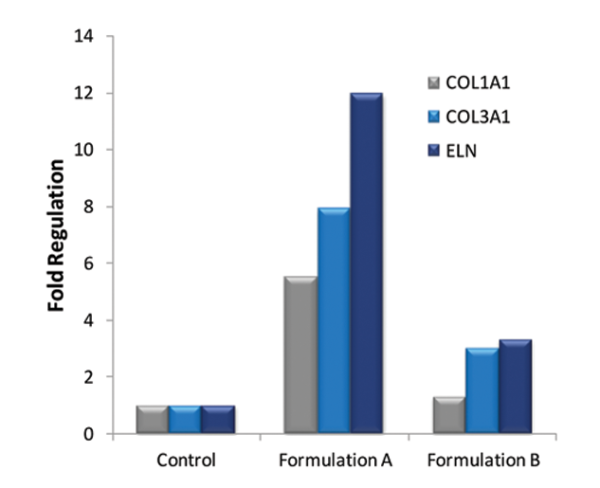 Tissues treated Formulation B resulted in significant increases in Collagen 3A1 expression (Figure 2). Additional anti-aging biomarkers include MMPs, TIMPs, Pro-collagen, Hyaluronic Acid, Inflammatory Mediators, etc. Evaluation of ECM components in the EpiDermFT in vitro human 3D skin model allows for the rapid and cost-effective assessment of topically applied formulations or active ingredients for efficacy and claims substantiation studies. Download the EpiDermFT Anti-Aging Application Note.